Barry Humphries is an Australian comedian, character actor, script writer and film producer, an award-winning writer and a star of London’s West End musical theatre. He has appeared in a plethora of films including Bedazzled, Nicholas Nickleby, Finding Nemo and Spice World. He is an instant sell out each time he appears on Broadway and in the West End. Barry appeared as a judge in 2008 on BBC 1’s I’d Do Anything, the search for the new Nancy and Oliver! In February 2010 Barry featured in an episode of the comedy panel quiz QI series 7. Barry is perhaps best known as his on-stage and television alter-egos, the universally adored international housewife and Gigastar, Dame Edna Everage, and the foul-mouthed Sir Les Patterson. 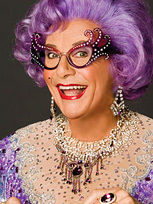 Dame Edna is probably the most popular and gifted woman in the world today. Housewife, investigative journalist, social anthropologist, talk show host, swami, children’s book illustrator, megastar, celebrity spin doctor and icon. During the 1970’s Dame Edna’s success in her homeland was repeated in Britain with London stage shows including Housewife Superstar! and A Night With Dame Edna. Subsequently, she has performed at London’s Royal Albert Hall, at the prestigious Theatre Royal Drury Lane, and the Theatre Royal Haymarket. In 2009 Dame Edna, along with ‘Sir Les Patterson’, went on a UK nationwide tour of Last Night Of The Poms. 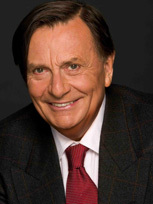 Barry is available as a host or after-dinner speaker for a whole variety of events. Alternatively his alter-egos Dame Edna Everage or Sir Les Patterson can host your event instead!